The Dodgers aren’t stupid. And neither is Major League Baseball. People wanted to know if the Los Angeles Dodgers would do as the NFL continues to do, and kneel during the national anthem tonight against the Houston Astros. Smart move by the Dodgers, and I expect the Astros will feel much the same. First, there are far fewer blacks in baseball than football. Sure, there are many men of color in the major leagues, but they are not black. On the 2015 Opening Day, the number of players from the 25-Man Major League rosters who identified themselves as African-American or Black was approximately 8.3 percent. This figure represented a 0.1 percent increase over 2014. The first round of the 2014 First-Year Player Draft featured the selections of five African-American players (five-of-34, 14.7 percent). African-American players accounted for 12 of the 73 selections that were made on the first day of the 2014 MLB draft. The percentage of Latino players increased from 28.4 percent in 2014 to 29.3 percent on 2015 opening day rosters. The percentage of Asian players decreased from two percent in 2014 to 1.2 percent in 2015. And finally, the percentage of white players decreased from 60.9 percent in 2014 to 58.8 percent in 2015. These numbers bring me to my second point. Many of the players in baseball come from impoverished countries. They know what it means to escape poverty and to live in the United States. Latinos make up almost three times the blacks in baseball, and whites remain the largest ethnicity. Given the two latter statistics, blacks will find little solace from their teammates, particularly the Latinos. So the notion that both teams will stand during the anthem should surprise no one. In the entire year of NFL kneeling controversy only one player took a knee all season in the MLB. That player was Oakland A’s Bruce Maxwell. Maxwell finds himself alone on an island. And I suspect no ship will sail close enough to help him. The fact is nobody joined him all season. And despite being a “first”, he gained no notoriety from the childish act. What took so long for baseball? It is perhaps not surprising that it took baseball nearly 13 months to see its first player do what then-San Francisco 49ers quarterback Colin Kaepernick first did by taking a knee before a preseason game in August 2016, and that it is still waiting for a second player to join Maxwell. 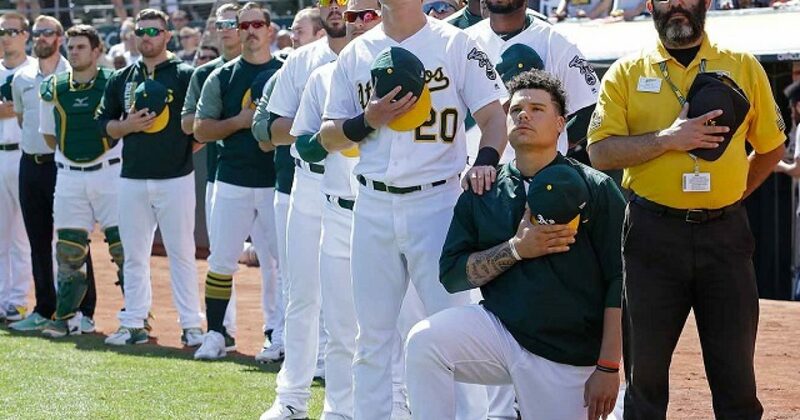 On Sunday, Tampa Bay Rays pitcher Chris Archer, one of only 62 African Americans on Opening Day rosters this season, gave voice to why it may be a long time before baseball sees other players lining up en masse to join Maxwell’s protest. In part, the issue in baseball is one of sheer numbers. African Americans made up just 7.7 percent of MLB players this season, according to the Institute for Diversity and Ethics in Sport at the University of Central Florida, the sport’s lowest percentage since 1991. White players make up 57.5 percent, with Latinos at 31.9 percent and Asians (1.9) and “other” (1.1) accounting for the rest. The NFL and NBA, by comparison, are majority African American. So in other words, you hire too many blacks, and your business is ruined? There certainly is a modicum of truth in this, as the NFL is certainly finding out.